When I moved back to the UK from Australia, I decided that my favourite brownie recipe was just too much effort (melting chocolate? Haven’t got time for that crap!) so I looked around for something quicker. And to make it even speedier, the recipe I now use (with a slight modification) basically has you prepare your own box-mix, so when you have a brownie craving, which to be frank occurs way too often, all that measuring’s done. Or would be, if you could be bothered to measure out brownie ingredients and then resist the temptation to actually bake them straight away. * I sometimes reduce the sugar to 2 cups (because it obviously makes it way healthier!) and I don’t notice a difference. ** I use 100g because that’s the weight of the cheapo bars of chocolate in the supermarket, and if I didn’t put it all in the mix, I’d just eat the rest anyway. Substitute with dark or white chocolate, nuts, sugar coated chocolate drops…the list could go on. Find a suitable pan. 9×13 inches is in the original recipe, but I’ve also used 12×12 inches, 9×6 inches, 9 inch round, muffin trays and mini muffin trays; metal, pyrex and silicone. Line said pan with greaseproof paper, cupcake cases or silicone cupcake cases (these tend to work better than paper cases in my experience). Add all the dry ingredients to a large bowl. You could sift them. Normally that’s too much effort for me. Add melted margarine and eggs, and stir until just combined. Do a really bad job of scraping the mix into your pan so there’s more leftover for you to eat raw. Place on the middle shelf of the preheated oven. Fight over licking rights on the bowl and spatula if you’ve been silly enough to let someone else help. Cooking time will vary depending on the size of your pan. My 6×9 inch pyrex dish took 60 minutes as it ended up pretty deeply filled, but start checking from 25 minutes. The centre shouldn’t wobble when you gently shake the pan. Wait for it to cool (at least a little) before cutting. 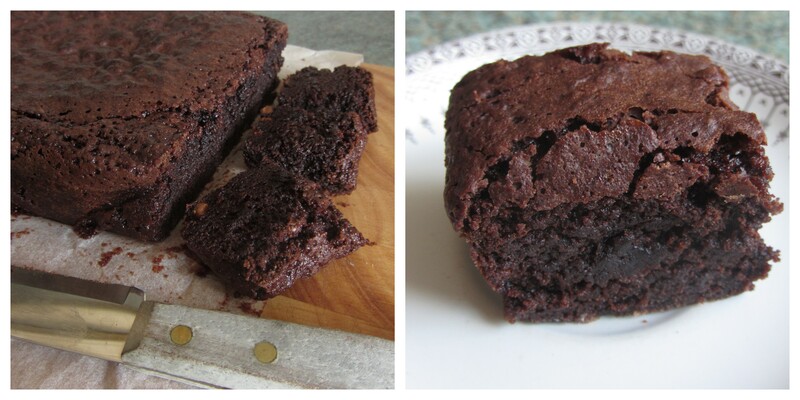 Cost: Excluding baking powder and salt, this batch of brownies cost £1.90 to make.